Sigtech offers Wireless Protocol Stacks covering Layers 1, 2 & 3 of the relevant ETSI standards for Professional Mobile Radio. Our TruSuiteTM range of Protocol Stacks include the complex DSP firmware required for layer 2 and currently support Base Stations and Mobile Stations conforming to the TETRA and DMR standards. Our fully conformance tested TruSuiteTM Stacks are “ready to go”, thereby reducing our customer’s risk while significantly reducing their time-to-market. 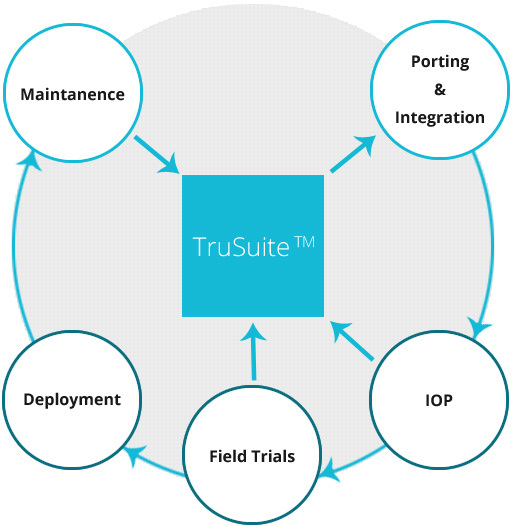 The modular flexible and scalable architecture of the TruSuiteTM range allows it to be easily ported and optimized for a range of hardware and operating systems. Our skilled DSP and Protocol engineers ensure that our customers receive code that is totally integrated with their hardware, meeting memory footprint and power constraints. Our TruScopeTM software embedded in the equipment eases the task of IOP testing, field-testing and debugging. Sigtech Wireless brings together its proven PMR software stacks, DSP software and Hardware expertise to provide a totally integrated, interoperability tested PMR solution that vendors can take to market with the least possible delay. Whether it is our reference or customer provided hardware, we ensure that our software is efficiently ported and optimized. We also specialize in custom crafted solutions to enable our customers to provide innovative products that differentiate themselves from the competition. Whether it is a custom solution or our standard TruSuiteTM Protocol Stacks, we work closely with our customers, assisting them to deploy their products and providing them with efficient and cost effective solutions.